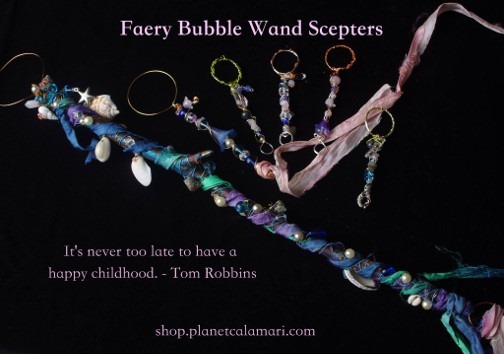 Gifts for your Inner Child! Now that summer is almost here my intention is to play more, enjoy life and allow my inner child to have some much needed fun. I encourage all to do so. All work and no play makes for a cranky acupunk! Do you remember blowing bubbles as a child? Why did you stop playing? Bubbles are precious moments of magic. Fragile rainbow orbs floating to heaven. Bubbles have been used in art since ancient times to represent auras and halos of Angels, Buddhas and Hindu deities. Glinda the Good Witch in the Wizard of Oz movie floated down in a beautiful pink bubble. Those who practice meditation or do protection rituals against negative vibrations visualize a white bubble of light around them before leaving the house. Each wands holds a bit of enchantment waiting to be unleashed. Make a wish as they dance around you. In the words of Cinderella’s Fairy Godmother… Bippity Boppity Boo! Bubble Wand Pendant with Clear Quartz Crystal, Labradorite, Rose Quart. 24 inch silver ball chain included. This entry was posted in crystal jewelry and bubble wands and tagged acupuncture alexandria jeanie mossa, bubble wand jewelry, crystal bubble wands, crystal gemstones acupuncture, faery bubble wands, healing crystals, inner child therapy, jeanie mossa by jeanie. Bookmark the permalink.